If you like rustic decor, chances are that you might like to adorn yourself with a few rustic accessories as well. Right now vintage typewriter key jewelry is especially hot. I thought that I would jump on the bandwagon and create something from my own collection of typewriter keys. Many ideas came to mind but I thought I would start with a simple pendant necklace. The nice thing about any vintage items is that they tend to have a rustic feel about them to begin with. 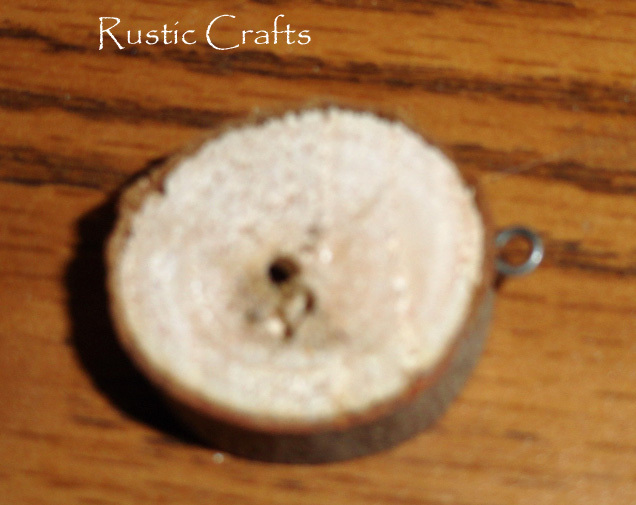 However, I wanted to add a little more so I decided to use a wooden disc from a birch branch for my pendant base. This craft is really very easy to do. You just need to have a few key items. 1. 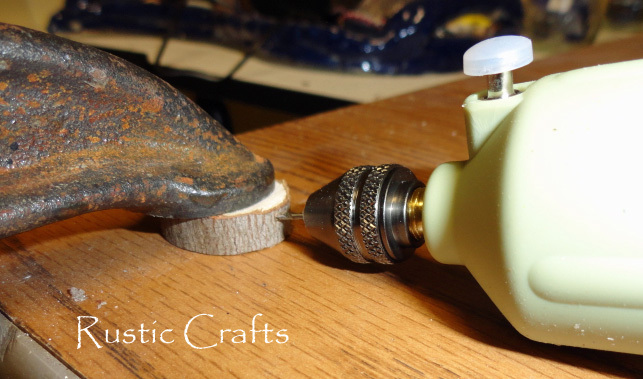 Clamp your wooden disc to your work surface and drill a hole about a half inch through the top. I used my new drill for women which once again worked liked a charm! 2. 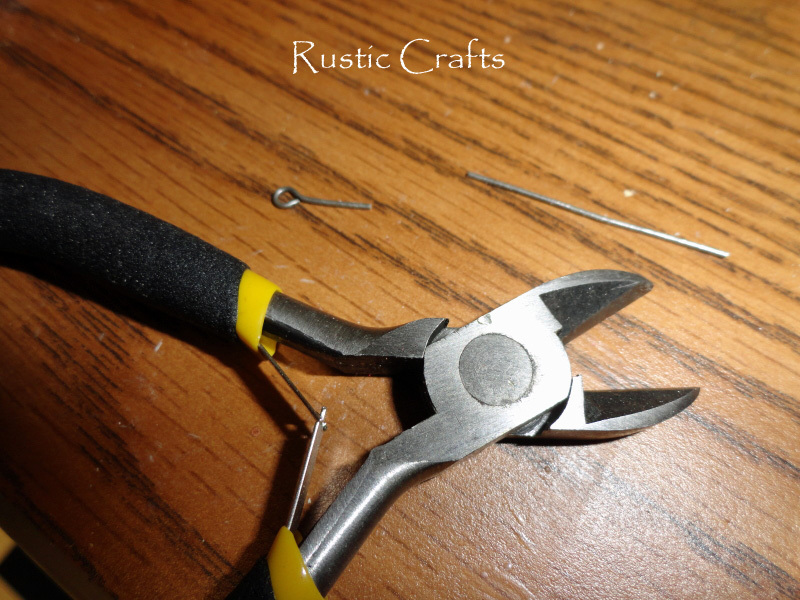 Take your beading eye pin and cut it with your tin snips so that the end with the loop is about a half inch long. Test it in the hole of your disc to see if it will fit all the way in with the loop laying flat at the top of the disc. 3. Apply glue to the end of the pin and insert it into the hole at the top of the disc. 4. With a paint brush, apply either decoupage or varnish to the branch disc front and sides. When fully dry, turn over and apply decoupage to the back. Lightly sand when dry for a smooth finish. 5. Glue your typewriter key to the center of the disc with E6000 craft glue. Since I was making my necklace as a sample, I just used a random number key. It would be fun to use a letter key of a person’s initial for this craft as well. 6. Attach a beading round to the loop at the top of the disc. 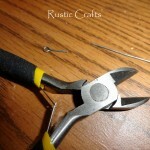 Use a pliers to bend the round back in place. 7. String a necklace chain through the round and your necklace craft is complete! What a great idea – there is something about vintage bits and pieces that appeals to everyone. I’m especially taken with the birch twig round – what a stroke of genius! Love this idea and it’s so versatile. I could see all sorts of special little somethings being attached to the wooden disk. I wonder if one of those teeny eye screws would work for someone who doesn’t have a drill? 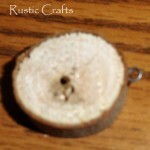 I’ve included a link to Rustic Crafts and this post as part of my site’s Tutorial Thursday.